You can install nearly any TrueType (.ttf) or OpenType (.otf) font on your iPad or iPhone. You can’t change the system font, but you can use your installed fonts in Word, Excel, PowerPoint, Pages, Numbers, Keynote, Autodesk Sketchbook, Adobe Comp CC, and more. Fonts must be installed using a iOS configuration profile. While you could create these configuration profiles on a Mac, there’s an easier way to do it. Apps like iFont, AnyFont, and Fonteer all let you download a font on your iPad, and then quickly package it into a configuration profile you can easily install. These apps let you install fonts in .ttf or .otf formats. They also support .zip files with .ttf or .otf fonts inside them. All three apps work similarly, but have slightly different interfaces. 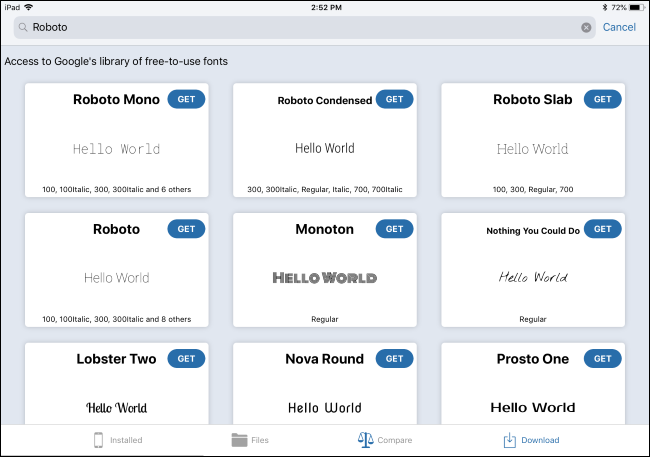 iFont is completely free with advertisements, although you can pay $0.99 to remove the ads. AnyFont requires an up-front $1.99 purchase. Fonteer lets you install up to three fonts, but you’ll have to pay $1.99 to install more. We’ll demonstrate this process with the iFont app that anyone can use for free, but it’s very similar if you choose AnyFont or Fonteer instead. To get started, you’ll need to find and download the font (or fonts) you want to install. You may be able to download the font from within the app itself. For example, in iFont, you can tap the “Download” tab at the bottom of the app to view a list of fonts from Google’s font library. You can then search for any font in the library and tap the “Get” button to download it to your iPad. You can also just download fonts from the web. Head to a font download website in Safari, and then tap the download link. 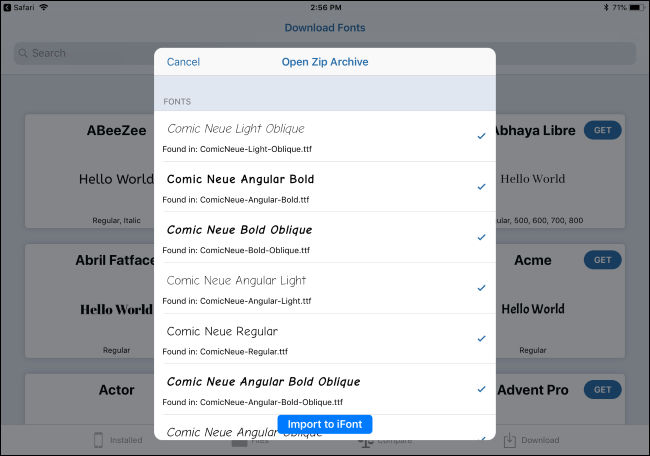 If the font is available as a .zip, .ttf, or .otf file, you’ll see an option to “Open in iFont” or your app of choice. If you don’t see “Open in iFont” or the equivalent option for your font app of choice, tap “More” and select “Copy to iFont”—or whichever app you’re using. 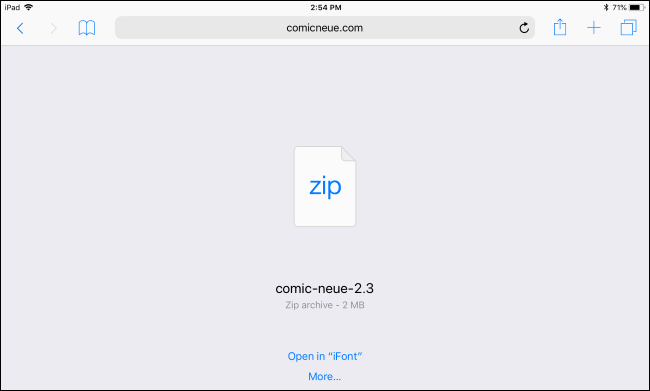 You’ll be prompted to import the fonts from the downloaded file into your font app. You can also save the fonts to a location like iCloud Drive, and then import them from within whichever font app you’re using. Any fonts you’ve downloaded aren’t installed system-wide yet. To install them, look for an installation option in the installer app. In iFont, tap the “Files” option at the bottom of the app. You’ll see a list of font files you’ve downloaded. To install a font, tap it in the list, and then tap the “Install on [Device Name]” option. 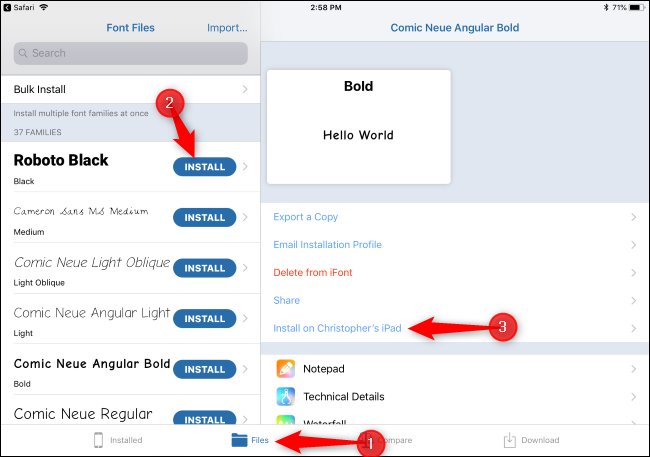 You can also tap the “Bulk Install” option to install multiple fonts at once. Tap “Allow” when you’re prompted to open a configuration profile in your Settings app. Tap “Install” and enter your PIN when prompted to install the fonts you’ve selected. You’ll be warned that the profile isn’t signed with a key. That’s because it was generated on your device. You can see it’s safe by tapping “More Details,” which shows you exactly what’s in the profile—in this case, only the fonts you chose. Tap “Done” after the profile is installed. You’re now done, and the fonts should appear in any apps that support them. Your installed fonts appear in the fonts menu in various apps alongside the standard fonts. You don’t have to do anything special to find them. Just tap whatever “Fonts” button the app has and select the fonts you installed from the normal font list. If the fonts you’ve installed don’t appear in an app after installing them, ask the app’s developer to support user-installed system fonts. You can see a list of fonts you’ve installed by heading to Settings > General > Profiles. If you installed a large number of fonts at once, you’ll see a single profile containing multiple fonts. If you installed fonts one by one, you’ll see multiple profiles, each containing one font. You can tap a profile, and then tap “More Details” to see exactly which fonts are inside it. To remove a profile from your system, tap it, and then tap “Remove Profile.” This removes the profile and any included fonts. Your iPad or iPhone may have other profiles here that don’t just contain fonts. 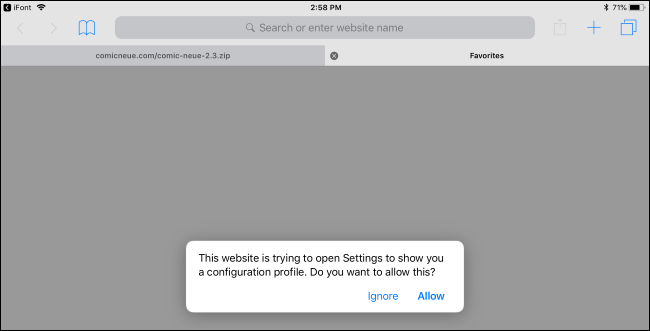 For example, if your iPad or iPhone was issued to you by your employer, they may have installed one or more configuration profiles that configure your device with your workplace’s desired settings. You probably don’t want to remove these.